This lecture by a Franciscan bishop in Australia is a mixed bag, but the thrust of it is what happened in the 1960's when promoting the "spirit" of Vatican II--denigrate what came before and marginalize and humiliate those who embrace the pre-Vatican II mentality! MY COMMENTS IN TEXT OF SPEECH IN RED. Pope Francis and the challenge of being church today. What a difference the Holy Spirit can make! When Pope Emeritus Benedict XVI announced his resignation in early 2013, we were adrift like I was adrift in the Pacific Ocean during my epic voyage. Why? Because in 600 years, there had not been a papal resignation. There had not been any hint of it prior to the announcement that surprised everyone, even the cardinals who had been summoned to the Vatican for the consistory. They were absolutely flummoxed and speechless. Holy smoke and holy chaos! The Barque of Peter was truly launched into uncharted waters. We Catholics felt we were in dire straights. The mood wasn’t good. And yet somehow that mood was changed remarkably with the arrival of a rather unlikely pope. He said it himself as he appeared on the balcony after the conclave: “The cardinals have gone to the ends of the earth to find the new Bishop of Rome”. Talk about a God of surprises. It’s like Princess Penzance and Michelle Payne winning the Melbourne Cup. No one saw it coming. No one predicted it. I have a particular interest in the biblical experience of the exile. My personal story of being a refugee, my struggle for a new life in Australia, coupled with my Franciscan heritage have all contributed to the sense of hope which was the legacy of the exile of old and which should inform and enlighten our present exile experience. Like the prophets who accompanied their people, interpreted the signs of the times and led them in the direction of the kingdom –the arc of salvation history if you like- we must do the same for our people in the context of this new millennium. Our story, the Judeo-Christian story is a narrative of hope in despair and of reordering human relationships in the light of unfolding revelation. It began with the story in Genesis where the seed of hope was sown and a promise of redemption was made in the face of sin and brokenness. The story of the great exile likewise puts in bold relief how hope was born in a situation of utter vulnerability. In the light of this experience, there occurred a paradigm shift in the way the people related to God and to others. A vengeful, jealous, petty and tribal deity gave way to a much more expansive vision of the divine: a truly universal and all-embracing God. As a consequence, human relationships and social structures were reordered in a way that was consonant with the evolving consciousness. The Judeo-Christian story finds its ultimate expression in the life, death and resurrection of Jesus –the source and the ground of its hope and renewal. But it also continues to unfold throughout history, especially at its pivotal moments. Thus, when persecution forced the Church to disperse from her Jewish home, she learned to welcome the gentiles and became a refuge for the persecuted. When she came out of the catacombs into an imperial Christendom, places of learning, contemplation, prayer, and solidarity sprung up in response to the thirst for authentic discipleship, hope and renewal. Now we find ourselves in yet another pivotal moment in history. Just as the Berlin wall collapsed, the walls of Christendom too have been blown away the wind of secularization. We are forced to move out of our catacombs into the open, into the new unfamiliar world of post-modernity where nothing is taken for granted as far as faith and belief go. Like the disciples on the Sea of Galilee, we are roused by the Spirit of Jesus to launch the Barque of Peter into deeper waters (Luke 5:4). 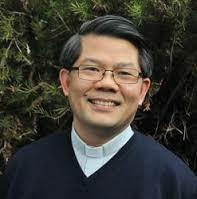 “Duc in altum” which is my episcopal motto is a perennial test of radical discipleship. It is a call like that of Abraham and Sarah, to leave the familiar and the comfortable, to go to the unknown destination. (Not knowing where you are going is the road to destruction and not necessary as Catholics. We know that Catholic identity lived to its fullest leads to the cross, to weakness and death and resurrection.) It is a theme made with urgency and constancy by Pope Francis. It is a church that dares to risk the new frontier rather than a church that anchors in a safe harbor. The Barque of Peter is once again pushed out into deeper and more treacherous waters. Here, in the new exile and inhospitable landscape, we must learn to walk with others: other faiths, other traditions, other voices including those who oppose and are critical of us. We learn to be the humble servants of the Kingdom and the sacrament of God’s love and presence in the world. One of the stories that has a feminist touch and a particular relevance to us today is the story of the Hebrew midwives Puah and Shiprah. Their courage, imagination, and daring are highlighted in the very first chapter of Exodus. It was a critical situation vis-à-vis the future of a people. Yet Puah and Shiprah were up to the task of reframing a harsh reality into a vision of fresh hope. They did so by refusing to obey Pharaoh’s command and by showing faithfulness to God in delivering new life, thus securing a vital future for his people. Today, in the midst of many situations of seeming hopelessness, it is easy for us to be overwhelmed and numbed. We feel unable to meet the challenge of delivering new life on behalf of those who feel hopeless and disenfranchised. Yet like Puah and Shiprah, we are challenged to present an alternative vision of fresh hope. When we are on the side of the poor, the vulnerable, the suffering people and when we stand in solidarity with those without hope and act together, we can be channels of hope. In opening our eyes and hearts to the sufferings of our world, hope can be awakened, a hope that allows us to see things from the perspective of God. This was what Mary MacKillop did when she rallied her sisters behind the poor and vulnerable in colonial Australia. She took a prophetic stance not simply in providing affordable quality Catholic education and health care to the poor masses but fundamentally in meeting the great cultural challenges of their times. “Never see a need without doing something about it”. In acting out of a strong passion for the Kingdom and a visceral compassion for the suffering, she brought about a fresh hope for others. Like her, we are called to be channels of hope and to meet the challenges of our times. In what ways can we follow her prophetic vision and apply it to our context? Who are the people without hope and how can we reframe the harsh realities that they experience into a hopeful future? The church without its missionary impulse is unhealthy. For him, this missionary impulse has little to do with doing the minimum, with complacency and mediocrity. In fact, it has everything to do with taking risks and living with enthusiasm and commitment. We should not be content with status quo, especially when that status quo is less than what God wants for us as individuals and as a community. Australia is a wonderful country but where it is in terms of its treatment of asylum seekers, indigenous and marginalized people should trouble us. If one can detect the direction of Pope Francis’ pontificate, it has something to do with the movement from security to boldness, from inward looking to outward looking, from preoccupation with our status quo, safeguarding our privileges to learning to be vulnerable, learning to convey God’s compassion to those who are on the edges of society and church. Hence our challenge is to accompany people from the margins into a journey towards the fullness of life and love. It is to embrace the call of the Vatican Council to identify with the joys and hopes, the griefs and the anxieties of those who are poor and in anyway afflicted. It is to be the bearer of joy to those who are most deprived of it. To do this, he/she must be able to live in and to bridge the yawning gap, the liminal space between the ideal and the real, between what the Church teaches and how the people respond. We feel torn between the two. As representatives of the Church and her servants, we want to be faithful and preserve her unity and integrity. And yet on the other hand, we know that we must also walk with our people, identifying with them in their struggles, their questions and their uncertainties. We know that the faith and its radical demands cannot be compromised and accommodated to suit everyone’s interpretation. At the same time, the fifty shades of grey that life can present to the people in the real world demand that we walk with them in the search for truth in love. We look to Christ for inspiration in the way he immersed himself in their world and walked with them on the journey to liberation. In fact, history has shown that religious life is invariably involved with a critique of status quo, a dissatisfaction of accommodation and a search for fresh and radical ways of following Christ. The challenge for those who wish to live the ideals of the Gospel is to not lose sight of the divine pathos and God’s preferential option for the poor. It is a vocation of the Christian leader to be with his people in their hopes and struggles, anxieties and fears. He/she is to be “a Malcolm in the middle” who occupies in betwixt and between, liminal, peripheral and precarious places. It is not easy to be in the middle, and to be loyal to both ends of the spectrum, to belong to the Church of orthodoxy and yet also to minister in the world of the unorthodox. That is really between the rock and the hard place as they call it. Yet, that is the calling of the leader, because we are meant to be in the coal face, in the messiness of it all and at the same time in fidelity to the Gospel. We are sent to the strong and the weak, the wholesome and the broken, the churched and the unchurched, the pious and the impious, the normal and the bizarre. We are sent to them through the gate, who is Christ. We are sent often from the inside out and not from the outside in. Like Christ in his ministry among the sick and the lost, we are called to meet God in the most unlikely people and places. Pope Francis challenges all of us to divest ourselves of clericalism and elitism, and return to the purity of the Gospel. His constant call to the church to be less concerned with itself and to be more outward looking encourages us to walk with our people in the ambiguities and complexities of their lives. The self-referential church steeped in a culture of splendour is in stark contrast with the church of the poor and for the poor. It is the latter that we who pattern ourselves according to Jesus the prophet on the margins endeavours to serve. It is like new wine in new wineskins. The leader for today’s church and today’s world is like Christ among the marginalized, the sick and sinner. How can we respond to the challenge of being a church at the margins today? Where are the new “peripheries” and new “horizons” in Catholic education that we are called to be and to offer nearness and proximity? By proclaiming the Jubilee Year of Mercy, Pope Francis wants it to be a special time for the Church to contemplate the mystery of mercy and become a more effective sign of God’s action in the world. The symbolic opening of the Holy Door in Rome –which is to be replicated in all particular Churches- serves to remind us of the joy and hope that the Holy Spirit ushered through the Second Vatican Council. One cannot help but feel the ardent desire of the Holy Father in relaunching the project of the Council which is to present the Gospel to the men and women of their time in a new, fresh, more accessible and credible way. “The walls which too long had made the church a kind of fortress were torn down and the time had come to proclaim the Gospel in a new way” (MV4). Pope Francis uses a rather unconventional term to describe the church. He famously says that pastors need to wear the scent of the sheep. Then he describes the church as a field hospital that treats the wounded after the battle. “The thing the church needs most today is the ability to heal wounds and to warm the hearts of the faithful; it needs nearness, proximity”. That is his vision of the ideal church. Not a perfect society, nor the enclosure for the privileged but a refuge for the poor, an oasis for the weary and a hospital for the wounded. When I was in Italy, I was very intrigued by the private tombs in many churches. In medieval time, it was not uncommon for high ranking ecclesiastics, royals and even well-heeled citizens to be buried in ornate church buildings. I wonder if this was a vestige of the time when the Church was the arena for power. I wonder if this was the natural progression of the imperial Church which came to be born after the conversion of Constantine. Thank God Pope Francis has reclaimed for us the vision of Church of the “anawim”. “Anawim” refers to the faithful few or the remnants who endured much suffering and who formed the nucleus of the new Israel after the exile. The field hospital is not concerned about defending against threat of encroachment and loss of its status and privileges. Instead, it goes out of itself to respond to the needs of those whose lives are at risk. It engages with the world rather than withdraws into enclaves. In fact, time and again, Pope Francis challenges the church to not be concerned with its own prerogatives. “I prefer a church which is bruised, hurting and dirty because it has been out on the streets, rather than a church which is unhealthy from being confined and from clinging to its own security”. Being merciful is at the heart of Catholic identity. It is not simply a matter of acting with mercy and compassion to those in need with our position of power and privilege intact. Rather, it is a radical discipleship of vulnerability and powerlessness in the footsteps of the humble servant of God. It is an existential stance in favour of the weak and the vulnerable in the face of the prevalent business model of success and power. It is about building people and relationships rather than profit and size. (In the paper, the neighbours who fight the proposed development in Springwood are described as the battlers taking on a giant CEO Parramatta). It has to do with the Kingdom mentality rather than the empire mentality. How can we be the merciful face of God to a wounded humanity in our school communities and families? How do we balance the need for recognition and success on the one hand and the fundamental ethos of care for the broken and the wounded on the other? For me, one of the greatest challenges the church faces today is to be inclusive, to be a big tent church. Pope Francis urges us to be a church where everyone can feel welcomed, loved, forgiven and encouraged to live according to the Gospel. (Except if you embrace the Church as she was prior to Vatican II--you will be damned and excluded! Such hypocrisy!) You heard me say in my Installation Homily that there can be no future for the living church without this vital sense of ecclesial inclusiveness. By that I mean there must be space for everyone, especially those who have been hurt, excluded or alienated, be they abuse victims, survivors, divorcees, gays, lesbians, women, disaffected members (only liberal ones, not conservatives or the ultra orthodox!) The church will be less than what Christ intends it to be when issues of inclusion and equality are not fully addressed. That is why you heard me say that I am guided by the radical vision of Christ. I am committed to make the church in Parramatta the house for all peoples, a church where there is less an experience of exclusion but more an encounter of radical love, inclusiveness and solidarity. The teachings of Jesus like the parable of the Good Samaritan challenge us to think outside the square, outside the established patterns, norms and conventions. Jesus teaches us some home truths that are truly confronting and incisive. Samaritans were considered outsiders and outcasts by ordinary Jews. Yet in the parable, it was the Samaritan who was the unlikely hero. For he showed love and compassion to the person in need. On the contrary, the priest and the Levite who were considered the respected class of society and the custodians of tradition were found wanting. They put tradition and law in the way of basic human love. Thus, in crafting the characters in their cultural and religious context, Jesus really upset the tulip cart. He questioned the prevailing assumptions and stereotyped attitudes. He turned the presumed order of moral goodness upside down. The holders of tradition failed the test of good neighbour while the outcast proved himself an unlikely champion of basic human decency, mercy and compassion. We can no longer understand the parable just in terms of being kind to those in need. It is an incisive lesson that cuts our prejudice to the quick. The lawyer who posed the question to Jesus “who is my neighbour” went away with much more than what he had bargained for. He was challenged to be the neighbour and to be one like the Samaritan. It would have been a profound and indeed humbling revelation: The villain had become a hero and vice versa. The meaning of goodness, humanity, moral uprightness had been redefined. The boundaries of acceptance, inclusion and love had been annulled. Jesus had presented to him a radical new way of seeing, acting and relating. That is what Jesus consistently does. He has a habit of challenging ingrained stereotyped attitudes, subverting the tyranny of the majority, breaking social taboos, pushing the boundaries of love and redefining its meaning. “You heard it said that love your neighbour and hate your enemy. But I say to you….” His interactions with women, with tax collectors and other types of social outcast are nothing short of being revolutionary and boundary breaking. It is his radical vision of love, inclusion and human flourishing that ought to guide our pastoral response. As the Gospel illustrates, it is the holders of the tradition who are often guilty of prejudice, discrimination and oppressive stereotype. The Church today needs to examine its own attitudes and actions towards the victims of injustice and adopt what I would call a seamless garment approach. We cannot be a strong moral force and an effective prophetic voice in society if we are simply defensive, inconsistent and divisive with regards to certain social issues. We cannot talk about the integrity of creation, the universal and inclusive love of God, while at the same time colluding with the forces of oppression in the ill-treatment of racial minorities, women and homosexual persons. It won’t wash with young people especially when we purport to treat gay people with love and compassion and yet define their sexuality as “intrinsically disordered”. This is particularly true when the Church has not been a shining beacon and a trail-blazer in the fight against inequality and intolerance. Rather, it has been driven involuntarily into a new world where many of the old stereotypes have been put to rest and the identities and rights of the marginalised are accorded justice, acceptance, affirmation and protection in our secular and egalitarian society. In one of his interviews on a rather thorny issue of homosexuality, Pope Francis says that we must always consider the person, because – I quote “when God looks at a gay person, does he endorse the existence of this person with love, or reject and condemn this person?” It seems to me that the Pope has more than moved away from the approach of condemnation and judgement. He has refocused on the proclamation of God’s love for the poor, the vulnerable and the marginalised; he has firmly placed the pastoral emphasis on the dignity of every person; he has committed the Church to the way of engagement, affirmation and compassion which is at the heart of the Gospel. The Church can only be the conduit of compassion and speak the language of hope to a broken humanity when it truly personifies powerlessness and stands where Christ once stood, that is, firmly on the side of the outcast and the most vulnerable. The Synod on the family was essentially an exercise in administering the medicine of mercy to the wounded. In the past, the results of synods were sometimes seen to be foregone conclusions. This synod, however, has seen the unleashing of the energy long locked up beneath the ice of institutional security. Pope Francis has really lived up to his vision of the Church daring to break loose from its comfort zone and self-referential mentality. It is a church attentive to the signs of the times and incarnate grace at work in the world, even among the unorthodox and the marginalized. Much emphasis has been placed on the question of communion to the divorced and remarried. Yet, through the lens of mercy, the real question is how the missionary Church can accommodate and accompany those struggling to live and still falling short of the Christian ideal. This ecclesial inclusiveness which was instrumental to the doubting Thomas’ journey to faith is characteristic of a Church that walks the walk with the weak. Catholic schools are premised on the fundamental dignity of each and every person. Attention to the most vulnerable and needy is written into our DNA, our Catholic ethos. How can we be places where this sense of ecclesial inclusiveness is fully expressed? In what ways can we advance Jesus’ radical vision of love, inclusion and human flourishing in our communities? * Less a preoccupation for its own maintenance but more a concern for the kingdom of God. In the end, though, I firmly believe that we’re on the threshold of renewal and transformation. The Second Vatican Council set in motion a new paradigm that cannot be thwarted by fear and paralysis. Once the genie is out of the bottle, it cannot be put back. That new paradigm is one that is based on mutuality not exclusion, love not fear, service not clericalism, engagement with the world not flight from or hostility against it, incarnate grace not dualism. The Holy Spirit is at work even at a time of great anguish. He accompanies us as we move in the direction of the Kingdom. Pope Francis has unleashed a new energy, he has poured a new wine which cannot be contained in old wineskins. He has challenged us to move in concert with him and bring about the rebirth of the church. I am endeavouring to follow the pope’s lead. I have forfeited my Qantas Club Membership which is not a big deal these days. I fly with Tiger regularly –on a wing and a prayer. But that’s the easy part. The harder part is to do what most of you do, which is to labour at the coalface of the church. It is have the smell of the sheep, to walk with people, identifying with them in their struggles, their questions and their uncertainties. It is to discern and live out the vision of hope in the midst of life’s disappointments. May we be like the prophets for our people during this our contemporary exile. May we be strengthened to walk the journey of faith with them, proclaim the message of hope, the signs of the new Kairos and lead them in the direction of the kingdom. May all of us enact the rhythm of the paschal mystery of dying and rising in the pattern of our Lord who is the Alpha and the Omega. My final comments: The world, that is the secular world, embraces so much of what this good bishop is saying and he find appaluse from them which is what he wants. The reason for the applause is that the loss of true Catholic identity that sets us apart from the world, the flesh and the devil is undercut and marginalized. It makes it easier for the world, the flesh and the devil to have their day. Dictators do some good things, just ask Italians about Mussolini and Germans who saw Hitler as their savior. When the Church bows to this sort of stuff in the name of accompanying those who promote the antithesis of the what the true Church is about while incorporating some of her good, we spiral into the dismal situation in which the Church finds herself in Australia and other parts of the world. It's 2016. Why would anyone choose to embrace a pre-Vatican II mentality? Would a pre-Vatican II mentality in, say, medicine be worth embracing? Would a pre-Vatican II mentality in, say, electronics be desirable? What would a pre-Vatican II mentality be advantageous in space exploration? I prefer to embrace an August 27, 2016, mentality since that happens to require no pretending, no mental legerdemain or, failing that, use of some time-travel apparatus from an appropriately whacky science fantasy series of novels. I read through this all-to-familiar episcopal drivel until I came to the phrase 'ecclesia semper reformanda'. This was a 17th century Dutch PROTESTANT maxim which actually was challenged by Calvinists who believed that their reformed 'Church' could not be reformed further. It was never seen as being remotely Catholic. Had I been at this lecture I would have had a few questions for this mitred ignoramus. Why do you need to quote such nonsense at such length? The Church is in in a parlous state and is ill-served by bishops like this (that of Rome not excluded). In 2016 many pharmaceutical companies are being sued because they promoted and sold medication that harmed or killed those taking them. when a modern medical procedure proves to be harmful, who in their right mind would continue doing it?????? And you know, we are speaking about the Deposit of Faith and the continuity in that Faith from Christ to today. Your analogies seem quite wacky but that might be par for the course for those who think new and improved always is. what this pathetic excuse for a bishop fails to realize that VaticanII was supposed to influence the world for the better. What instead happened was the the world influenced the Church for the worse, and we have seen nothing but 50 years of decline. He can go to hell. Angry Old Man #1 says of a bishop, "He can go to hell." No, this is not spoken in sorrow. Credo te senior esse. Atque iratus necnon insanus. Esne is cui cognomen est 'os excrementi' (Gobshite)? Seeing as how the scientific method and universities (both Catholic inventions to a large extent) are both not only pre-VII but positively medieval, and without them we would have no modern medicine, electronics, or space exploration, I'm just fine embracing it (as opposed to the post-modernism of VII, which leads only to epistemological nihilism). Before the 1960's the Catholic Church was the state religion of many nations, operated hospitals and universities in many nations, and in many ways helped form the cultures and philosophies of many nations. How, then, can it be that the Church now claims that she is more engaged in a world that has largely forgotten her? Which tense more likely applies to a bishop who's led his flock astray? Hmm ... What did St. John Chrysostom famously say the road to hell is paved with? We've never had a Vatican II, so, am I post or pre Vatican II? Extra Vatican II? I think the Alice Blue tab shirt worn by his excellency pretty much sums up everything. A picture is worth a thousand words. Bertie - Both the scientific method and universities have evolved, changed, and developed since their beginnings. While medieval in their origins, they have been updated as needed in order to avoid becoming anachronisms. To grow is the change. To mature is to have changed often. Your 3:12 doesn't sound like your original point. His Excellency's shirt is much too pale to be considered Alice Blue. That anyone thinks the color of a bishop's shirt is an indication of "heterodoxy" pretty much sums up the value of the commenter's opinion. If the next conclave is staffed with a majority of cardinals of the same ilk as this bishop, divine intervention will be the only hope for the future of the Church on earth. I suppose a bishop has to write to the audience, so it would a mistake for me to expect the same dissertation here as Cardinal Sarah gave in London. But there seems to be some actual errors here, or at least foggy thinking, that leads the reader to conclude, or wonder if, changes in Church teaching are in effect. Most of Church teaching is immutable anyway, as Francis knows only too well. He can stuff the college of cardinals with as many yes-men as he likes, but it's not going to stop the rot. He won't live long enough to cause too much damage, the bulk of which was in any case done half a century ago. At grass-roots level, where most of us operate, the situation is actually improving. And if the next pope is Tagle (which I doubt) it is all the more likely that his successor will be Schneider. What is God doing in the midst of all of this confusion? I agree with your long-term analysis. Most younger clergy haven't been poisined with "progressivism" because they were raised in authentic Catholic families who had children and raised them properly in the Faith, no lacks to the heirarchy. When I attend my Novus Ordo Church of 27 years, the average age in the congregation is post 55, very few young children. In sharp contrast, when I attend a parish with the EF the average age goes down into the low thirties, with lots of young families with lots of children. The day I heard the 10 years old boy next to me chant the Pater Noster in Latin flawlessly, my heart swelled. I knew the Faith would somehow go on as Christ promised us, notwithstanding the left-wing loons hell-bent on turning us into either Protestants or agnostics. @ Dialogue: "What is God doing in the midst of all of this confusion?" @ Dialogue, God is also leading and guiding the Church, empowering men and women 1) to welcome the stranger, including those strangers who are Muslims, and 2) to defend the widow and the orphan, including those widows and orphans that come from Syria. God is calling younger men and women to serve as sisters and brothers, deacons and priests. Many are answering that call. God is challenging each of us to turn away from sin and be faithful to the Gospel. "At grass-roots level, where most of us operate, the situation is actually improving." Indeed, the main "Francis effect" I'm seeing is that--at least partially in reaction to the excesses of the current papacy--seminarians and newly ordained priests are probably even more orthodox and traditionally inclined than they might otherwise be. Thank you, Francis! In Europe and the Americas, the Church is in decline. But even a dying tree can produce some good fruit. Anonymous at 7:58, when Saudi Arabia allows Catholic Churches to be built within its boundaries, then report back. Until then, you're just another left-wing windsock, spouting the intrinsically evil Democratic Party's talking points. Love and compassion do no deny the existence of sin. Rather, love and compassion are to be founded on Truth. The bishop's views are based on emotionalism, a post-modernism gone too far. I wonder whether, beyond the power elite in society, people in general take such post-modernism seriously. Most importantly, one wonders what all these calls for changing the Church are all about, whether they are founded on the mistaken idea that human nature has changed since Adam and Eve. TJM - Yeah, those facts are just annoying to people like you, aren't they? You remind me of a certain troll over at Father Z's. You make inane comments and never directly address the comments made to you. So how about Saudi Arabia and those Catholic Churches not being allowed to be built there? So why would we invite them here to build mosques aka houses of terror? TJM - You remind me of, well, a rock. I come late to this discussion.